Sony and FIFA have teamed up to bring next year's second-biggest sporting event in 3D exclusively to those who truly appreciate the beautiful game. Read: not Americans. 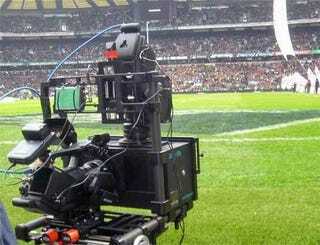 Sony will be lugging its 3D cameras to South Africa next year to film up to 25 World Cup matches. It marks a big commitment to a technology they're pushing hard, and comes on the heels of Panasonic's similar plans for a 3D Winter Olympics. More importantly, an accompanying 3D Blu-ray disc of match highlights will be released later next year that should play to the format's strengths. It'll also give you a chance to wear some fugly glasses.